The principal feature of blockchain projects is their decentralized character. The key condition of decentralization is the number of active members of the blockchain system. To attract and keep new community members, the projects propose economic patterns allowing to earn money not only on customary mining and trading. Bounty is a programme of rewards for assistance in project promotion. Software developing companies were the first to use this mechanism: in 2010, Google announced a bounty campaign for bug hunting, in 2013 Windows followed suit with a similar reward system. In the case of blockchain projects, the reward is usually paid in platform tokens. Such a marketing strategy resembles barter: anyone can get a reward for executing simple tasks promoting the brand. It can be writing and publication of advertisement posts, reviews and articles in social networks and profile forums, translation of the White Paper and other documents in various languages, hunt for software bugs, assistance in application development or in the creation of project brand and logotype. The bounty campaign conditions are usually published on the BitcoinTalk forum. The more complicated the task, the higher the reward. However, similar to the investment in the ICO projects, there is a high probability of encountering a fraudster. Even if the project was not initially fraudulent, in the case of its failure the participants of the bounty campaign are not likely to receive a reward consistent with their efforts because usually, the promised reward is a share of the crowdsale revenue. How much: Translating the White Paper of the SONM project, one of the top-20 most successful crowd sales, one could earn a number of tokens equivalent to $1,500 based on the token price during the ICO. We are living in the information era: thousands of gigabytes of data are being daily uploaded to the network – photos, files, and websites. According to the IDC research group, 16.3 trillion gigabytes of information are being annually produced in the world, and by 2025 this volume will increase tenfold, up to 163 zettabytes (1 ZB = 1 trillion GB). Taking into account such growth rates, not even the cloud repositories are likely to handle such data volume. Decentralised cloud repositories will help solve the problem. Participants of such systems fall into two groups: those who pay for data storing and those who offer their capacities for storage. The decentralization of cloud repositories is profitable for all: the storing price in such systems is lower than in traditional cloud repositories run by market leaders, and those who lease their disk storage space for data storing are paid in tokens of these platforms. However, it should be remembered that in order to become a storage capacity supplier, one should satisfy the requirements: a fast enough Internet connection and disk storage upwards of a certain volume. 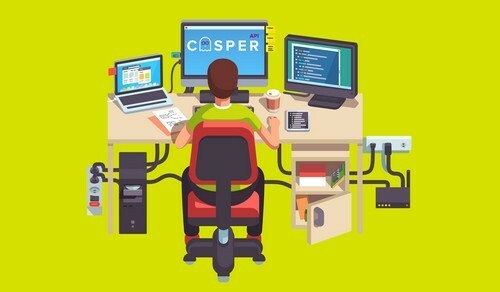 How much: The revenue of the storage space supplier in the Casper API project, enabling decentralized apps to store files in a decentralized system rather than in centralized cloud repositories, if 50 terabytes of data is stored, will amount to roughly $1,215 per month. Every day, thousands of people publish exclusive materials, columns, articles and researchers in such popular blogs as Medium, Livejournal and others. The development of the blockchain industry enabled a new format of such platforms, allowing to earn money on content creation, publication, and consumption. The major projects in this sphere are the English-language Steemit and its Russian-language counterpart Golos. The users of the blockchain-based social networks are rewarded not only for the publication of posts but for comments and upvotes as well. In Steemit, the reward is paid 24 hours after the publication. The amount of the award depends on the comments of other network participants and upvotes by curators. On the Golos platform, the author is rewarded in two periods – 48 hours and 30 days. It should be taken into account that the amount of the reward is not fully paid in liquid and traded tokens: both Steemit and Golos pay a part of the reward in internal tokens which are not exchange-traded. How much: the most popular publications on the Golos platform raise up to $300-$400, in the Steemit social network the payments may sometimes reach even $1,000. Ipsa scientia potestas est, or knowledge itself is power, said Francis Bacon in the late 16th century. In the 21st century we can complete the aphorism: knowledge is not only power but also money. Thanks to the blockchain technology, knowledge carriers can get rewards from the community. Several blockchain projects such as Cindicator, Augur, and Enigma, are working on platforms that would allow the analysts to monetise their knowledge. The more precise the forecast made by the analyst, and the higher his activity on the platform, the more important is the reward. How much: on the Cindicator project, the best forecast is rewarded with $120, and the aggregate prize pool for March 2018 amounts to $7,500. In power industry, both the generating capacities and the possibility to use them to earn money continue to be concentrated in the hands of big players. The decentralized ledger technology may allow any private persons to enter the market as energy suppliers if they have at their disposition a power-generating facility – for instance, a wind generator in their courtyard or a solar panel on their roof. Power surpluses can be sold through a decentralized p2p network if the generating equipment is branched to one. Such projects are currently only launched in testing mode and have a limited number of participants: for instance, Power Ledger (Australia) or the TransActive Grid (Brooklyn). However, such solutions are greatly promising: according to GTM Research, between the second quarter of 2017 and the first quarter of 2018 40 projects on blockchain use in energy networks attracted more than $300 million. How much: one kilowatt-hour in the TransActive Grid decentralized energy system in Brooklyn cost $0.07 during the test, and the whole transaction amount reached $13.65 (195 kilowatt-hours were sold).